SOLD but could make another similar. Artistic handmade, handcrafted executive custom desks made to order by Dumonds Custom Furniture. SOLD but could make another similar. Cantilevered walnut slab custom executive desk with a maple triangle base. Rustic claro walnut executive slab desk with birdseye maple drawer fronts and ebony triangular pulls. SOLD but could make another similar. Custom Ebony Executive Desk SOLD! But could make another similar black desk using Gaboon ebony. 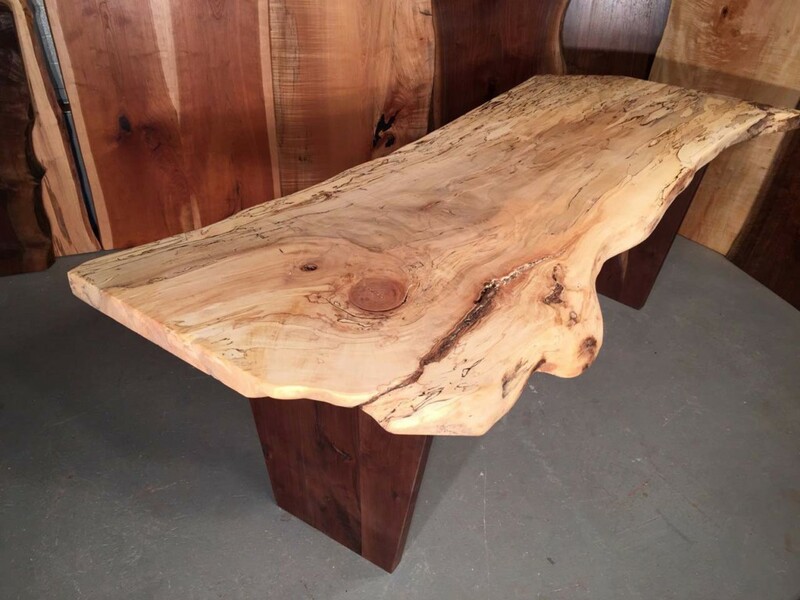 Our handmade natural custom executive desks have been called artistic, unique, unusual, one of a kind, rustic, modern, contemporary and traditional. Custom executive desks handmade to order by Dumonds Custom Furniture. Available now. Our handmade custom executive desks have been called artistic, unique, unusual, one of a kind, rustic, modern, contemporary and traditional. This walnut slab executive desk is using ribbed steel and timber frame hardware. Available now. Cherry slab front with Ebony butterflies, Ambrosia maple top on a steel base. Size 72″ W x 30″ H x 30″ D.
Rustic Burled Custom Maple executive desk featuring Ebony butterflies, 3 1/2 inch thick top, with the burl continuing into the slab base. SOLD but could make another similar. One of a kind executive custom desks handmade to order by Dumonds Custom Furniture. SOLD but could make another similar. Drop Leaf work area with redwood root burl inside. Size 32″ W x 63″ H x 26″ D.
Available now. Artistic executive custom desks made to order by Dumonds Custom Furniture. Size 90″ L x 30″ H x Aprox. 30 – 40″ D.
SOLD but could make another similar. Custom executive desks handmade to order by Dumonds Custom Furniture. Available now. Custom executive desks are made to order in Montana by Dumond’s Custom Furniture. Custom executive desks featuring walnut crotch top with quarter sawn sycamore butterflies, and double triangular solid cherry base. SOLD but could make another similar. This custom desk lives near Sun Valley, Idaho. It was built from some beautiful hand selected knotty cherry from Pennsylvania. This handmade custom desk has six drawers including two file cabinet drawers. SOLD but could make another similar. 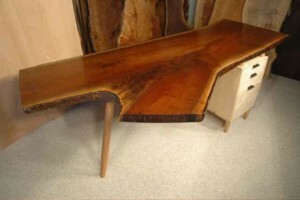 This custom desk features a magnificent crotch slab of walnut for its top. The bottom of the desk features an open design on its sides and three drawers for storage of paper and pencils. Walnut Slab custom desk with ebony accents. SOLD but could make another similar. A more shaker style custom desk made to order by Dumonds Custom Furniture. This desk was made of some nice curly maple and sold to a lady in Spokane, Washington for her home office. A Curly Maple Custom Desk with Walnut knobs. Size 38″ H x 40″ W x 20″ D.
SOLD but could make another similar. This desk features large pullout work areas to increase the overall workspace of the desktop. This custom desk was designed to be disassembled for easy transport in this mobile society. Pennsylvania Cherry slab custom computer desk with lower ash panels and ash slab sides. Size 25″ D X 72″ L X 28″ H.
SOLD but could make another similar. It has a large split up the end that was butterflied together with solid ebony. Ebony was also used for the drawer pulls. The lower desk panels are a free form ash slab found in a farm house outside of Salt Lake City, Utah. A Custom Desk in Pennsylvania Cherry Slab with Ebony accents and Utah Ash panels. SOLD but could make another similar. One-of-kind custom desks handmade to order in Montana by Dumonds Custom Furniture. Each desk is made with the customer’s needs in mind and hand crafted to be a functional work of art that will last for generations. Each desk is signed and dated by the craftsman who built it. Size 42 1/2″ H X 15″ D X 31″ W.
SOLD but could make another similar. Some of our desks have a more modern or contemporary feel to them. This maple cantilevered desk was inspired by some jewelry showcases that I saw in Homer, Alaska while I was on my honeymoon. I couldn’t wait to get home to start building this desk that was in my head and needed to get out. This custom desk is currently in inventory if you’d like to have it in your office. Available now. This handmade, handcrafted claro walnut slab table/desk is made to separate into 2 distinct units or can come together in a variety of different configurations. SOLD but could make another similar. Size 7′ L x 29″ H x 40″ D.
SOLD but could make another similar. Montana made….This double pedestal desk has an open feel to it. If you like the look of it, please give us a call today and let us make your office a more luxurious space with one of our unique and artistic custom executive desks. Size 30″ H x 84″ W x 22/32″ D.
SOLD but could make another similar. This custom desk was made for a client that lived in NJ and currently resides in the beautiful town of Park City, Utah. He’s an acupuncturist who helps people with their pain. I delivered this piece for his 40th birthday. His wife commissioned me to build him a desk for his home office that he could appreciate for a lifetime. He loves his desk. This couple has plans to have a slab dining table made to spice up their dining room. Available now.Available now. Recycled book matched maple crotch slab custom dining table/desk with inlaid ebony butterfly. This unusual handmade table has a rustic feel. The most beautiful maple crotch figure ever!!!!!!! Size 29/39″ W x 30″ H x approximately 84″ L.
SOLD but could make another similar. Log desks handmade to order. 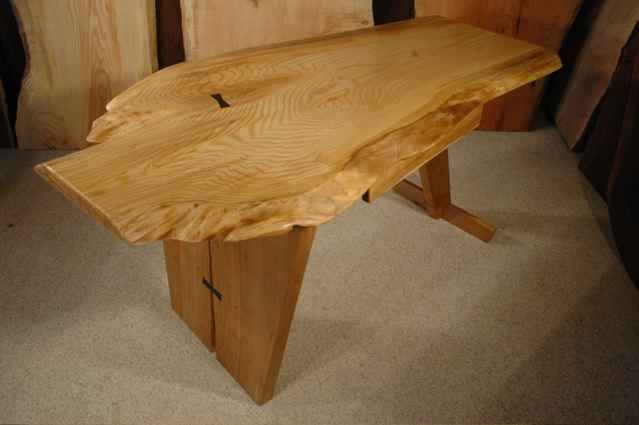 These custom log desks are sawn from exceptionally large logs. The trees measure up to 6′ in diameter. We also build log dining tables, coffee tables, beds, porch swings, kitchen islands and more. See our rustic furniture section of our site for more ideas. Handmade American Black Walnut executive custom log desk featuring walnut crotch top, and natural edged cherry base, with walnut log feet . Natural edged privacy panel with ebony butterfly. Available now. Approximately 7′ long x 29/39″ wide. Rustic Handmade Walnut Crotch Slab Custom Desk with Curly Maple Drawers and Ebony Pulls. 56″ x 33″ x 3.375″ Rustic Custom Walnut Crotch Slab Desk. Rustic 74″ x 43″ x 2.125″ Book matched Slab Claro Walnut Handmade Custom Desk with Curly Maple Chest of Drawers and Solid Walnut Slab End. 67″ L x 46″ W x 1.875″ Thick- Handmade Rustic Cherry Crotch Slab Executive Desk with Walnut Pedestal Base. 56″ x 33″ x 3.375″ Rustic Custom Walnut Crotch Slab Desk. The Handmade Custom Stock Farm Table version #1 with cherry spindle and solid rustic cherry slab base. Handmade 9′ Walnut and Curly Maple Custom Rustic Executive Desk with Hand Carved Ebony Drawer Pulls. The “Welch” 5×5′ Handmade Custom English Walnut Rustic Slab Executive desk. Dumonds Custom Furniture will Make Another Similar Desk Just For You! The “Boettcher” 5′ Custom American Black Walnut Handmade Rustic Slab executive desk. Dumonds Custom Furniture will Make Another Similar Desk Just For You. Salvaged walnut tree from Maryland. This is some exceptional curly walnut that was air dried for 5 years before building this outstanding desk. 7′ Spalted Maple And Walnut Custom Executive Desk. From salvage, recycled urban hardwoods that came from the Washington, DC. Built from urban salvaged wood from Maryland. 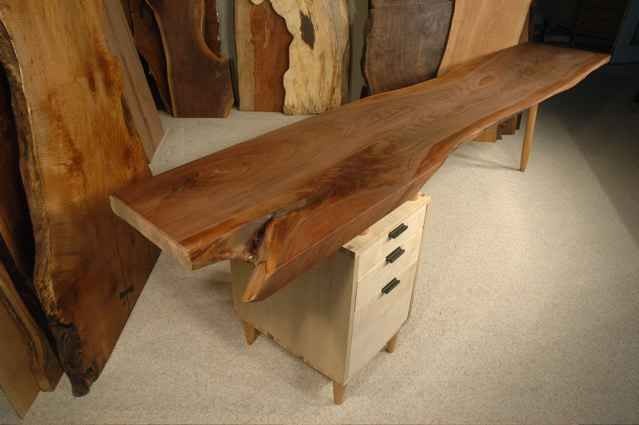 This live edge walnut desk is a beauty.